Ember Swift | » 11:11 — Make A Wish! 11:11 — Make A Wish! Saturday, September 10th, 2011, Blogs, Final Thought: Sparks from Few’ll Ignite Sound. I used to view my CDs as my babies. People would ask me which one I liked the best and I would say, “I can’t choose one child over another!” They’d laugh and I’d smile and then proceed to tell them of each album’s virtues, just like a proud Mom. There’s nothing like having a creature growing inside of you, who likes to kick your insides at random times of the day and night, to put a whole new spin on the idea of making (and releasing) a “baby”! And right now, since I just ate, “Little Spark” is having a serious dance in there as I continue arranging final details for the release tour. 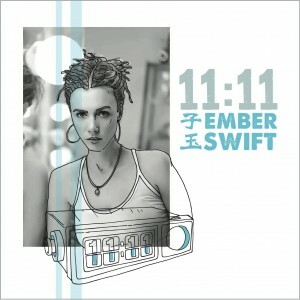 I called this album “11:11” not just because it is my 11th album and it’s 2011. That’s the basic answer, but there’s more to it than that. When I glance up casually and see “11:11” on the clock, either at night or in the morning, it always seems like a lucky sign, somehow. Auspicious. Sometimes I feel as though it’s those times, in their calm confidence, that push me to notice them, rather than it being me noticing the time. I always make a wish when I see it, as though the time itself can grant wishes. I just believe in its power somehow. It feels right. But first I should go back to the story of my 10th album, LENTIC. That record that was about marking a milestone in a history of releasig albums. It was #10 and it felt significant enough for a celebration! That celebration took the form of exploring a brand new musical territory, without apology or disclaimer. After ten records, I figured I was entitled to push the boundaries a little. It was also about aligning my brand new music with what was then also my brand new life in so many ways: a new country (China), a new relationship (with a man, no less! ), a new pace and lifestyle that had me slowing down and being more contemplative (Tai Chi study, etc.) and a new approach to music-making (electronic loops, etc.) All of that newness fit in well with a new musical style. It was in synch. Honestly, I had no idea what lay around the corner for me, musically, once LENTIC had been released and toured. I was happy to form a band here in Beijing, but little did I know how well we would mesh and become a family. I also didn’t expect that new songs would start to pour forth and find their way to the stage, or that I would suddenly be driven to create a “twin” version record, linguistically that is. (There are Mandarin and English versions of nearly all the songs!). Suddenly there was an album’s worth of material to record and four band members (including me) eager to make that happen. Everything just fell into place. Like a well-wished wish. So, “11:11” feels like a fated, natural, pre-destined conception that chose me, chose us, and now will hopefully choose you as listeners. Like human souls that may very well choose their next incarnation, I think this musical baby has decided on its arrival and its format in all ways. Musically, it is a lot like my older material in that it is stylistically diverse, band driven (not electronic), and message-based. There’s something for everyone. But in terms of personality, “11:11” is a self-realized body of work (fan funded!) that has nothing to proove, revels in joy, and dances on the inside. It’s alive in ways that I had never conceived of before. I feel really lucky to have been part of the project and to now be able to present it to you. And so, “11:11” will be my first birth this year, musically that is, and then first thing next year, I’ll be a Mom to “Little Spark.” I don’t think life gets any more lucky than this! It’s “11:11”: MAKE A WISH! Help A Foreigner Stay on the CHINESE ROCK CHART!